The following gives a point-form overview of the history of Traditional Medicine. It is intended to be brief and to allow people to see what was happening in different systems at a given time. Some of the information, especially regarding early sources may not be verified as some of it is the opinion of individual researchers. However, it serves to show a broad picture of what was happening in various systems at various times. Stone age man has been found with seeds and from numerous medicinal plants showing that humans have been using plants as medicine in one form or another for 10,000's of years. Sumerian writing on medicine from 3000 BCE showing they already had an elaborate medical system and an advanced Materia Medica. Their medicines was diagnostic-based. Trade of early medicines including Frankincense (between India and Arabia) were being traded from prehistoric times. Sheng Nong; Mythical Chinese physicians said to have lived 2800BCE. A herbal attributed to him Sheng Nong Pen Cao (see below) is believed to have been written around 200AD being a compilation of Oral teachings. 2700 BCE; Merit-Ptah; Chief Physician in Ancient Egypt; first recorded Female Physician. 2600 BCE; Imhotep; ‘The one who comes in Peace, is with Peace’; Chancellor of the King of Egypt; High Priest of Heliopolis; the Kings Physician; Chief official of the Pharaoh Djoser. 2600 BCE, the oldest record of medicine from Mesopotamia which described thousands of medicines including Cedar wood, Cypress, Licorice, Myrrh and Poppy juice. Sumerian Medicine was said to be well established for centuries by this time. The Mesopotamian King Nakhunte is said to have brought his people to the Yellow River Valley in China approximately 2300 BCE. Albert Terrien de Lacouperie, a French Philologist (1859) equated the Yellow Emperor with King Nakhunte, proposing the Chinese ‘Huang Di’ was derived from hun-ti, the family name was Nak, thus Nak-hun-ti. He also published works claiming early Chinese language was heavily influenced by Akkadian and Susian languages, and even found great similarities between the hexagrams of the I Ching (Book of Changes) with Mesopotamian Cuneiform. Thus, the origins of Chinese Medicine and large parts of Chinese culture could originally have come from Mesopotamia. 2100 BCE Sumerian Tablet containing written prescriptions from this period is one of the oldest written collection of prescriptions. Sumerian Medicine blended physical medicines with Magic and Incantation as most ancient medicine did. It was believed that illness was a punishment for wrongs that had been done. Sumerian medicine used over 250 herbal medicines, 120 minerals, and various animal products. 2000 BCE Thoth (above) the Egyptian God of Knowledge, was said to have revealed various secrets to man including Medicine and Alchemy, but in a form that only the wise could decipher. Fu Hsi reigned about 2000 BCE and founded China’s first dynasty. He is believed to have invented writing, painting, music, the I-Ching and the Yin-Yang concept. 1500 BCE Vedic texts are said to date from around this time (1500-1200 BC; although some sources have said they were first written not later than 2000 BC and may be as old as 4500 BC); these were written in Sanskrit, and contain 4 Books of Wisdom. One of these is the Rig Veda (The Veda of Verses) which were dedicated to the Medicine God Soma. The Vedas make reference to many important medicines, many of which have compounds identified as important medicines by modern science. The Vedas talk much of medicine, including the use of Metals in health preservation. The Atharva Veda (Veda of Charms) talks of reducing Metals in Bhasma (ash form) for medicinal use and also describes the use of Mercury. 1500 BCE Ebers Papyrus was also written around 1500 BC, and contained 700 medicines (including Wormwood, Aloe, Myrrh, Peppermint and Castor) and 800 recipes, which included pills, oils, salves, infusions and poultices. It was essentially a Book of Formula for the 3 types of Physician: those that treated internal and external disease, surgeons who treated Fractures and Wounds, and Magi who treated with Magic and Incantation. It contained, for example, a remedy for a Diabetes-like disorder. The largest Babylonian medical text, the Diagnostic Handbook, was written between 1069-1046BC. It presented diagnosis, prognosis, empirical theory, logic and rationality. It contains numerous prescriptions, and is said to have perhaps influenced the writings of Hippocrates. In it, Epilepsy is referred to as 'The Falling disease', the possible origin of the 'Falling Sickness' as the disease was called in the Western Tradition for over 2 millennia. It was around this time that the Epic of Gilgamesh was written. Gilgamesh lived around 600 years before this time and ruled Babylonia, and his story was written in a poem. He was a hero-king, and according to legend, he searched for the miraculous live-giving herb, the most powerful of medicines, to save the life of his good friend. After finding it at the bottom of some water, he fell asleep exhausted. A serpent appeared and ate the herb, and ever since, the serpent renews itself by shedding its skin while mankind was kept from the restorative properties of the herb. The Upanisadic Period of India (1000 BCE onwards); during this period the knowledge of the Vedas was systematized. The Classical Ayurvedic texts of Caraka Samhita and Susruta Samhita in their present form came from before the 7th Century BC (although may have been written earlier). Caraka lists Animal, Vegetable and Mineral medicines; from the latter category can be found such metals as Gold, Iron, Copper, Tin, Silver Lead etc; various Gem stones, as well as various Earths, Salts, and Arsenic, these being used both internally and externally. Mercury, Sulphur and Copper Pyrites are also used internally. Elaborate processes of preparing these Metals and Minerals included using herb juices and decoctions in their preparation. Susrata (right) practiced Medicine and Surgery about 600 BCE. His collected writings known as Susruta Samhita describes similar procedures and uses, and is perhaps better than Caraka Samhita for its reference on Pharmacology; it deserves special attention for its treatment of Surgery. Buddhist period of India; during this period, Universities were established in Taxila and Nalanda which were centers for medicine. In order to gain admission to the University of Taxila, prospective students were sent out in search of any plants which were not medicinal. One pupil by the name of Jivaka returned after some time claiming he could find no plants which were not medicinal. Many stories and legends exist about Jivaka and his keen sense of observation. It is said before the Buddhist period that surgery was very advanced in India with Caesarean sections and plastic surgery being documented. However, after this period, the knowledge of surgery declined and Alchemical medicines based on minerals and metals then became advanced. Artha Sastra (4th Century BCE) describes the use of various Metals and Minerals in medicine, including one type of Gold prepared from base Metals with the aid of Mercury. Nagarjuna (340 BCE), a famous Mahayana Buddhist Philosopher and Alchemist has much influence on the promotion of both Buddhism and Alchemy. He was said to have traveled to the land of the Nagas where he first learnt Alchemy; he wrote one of the earliest Alchemical Treatises called Rasa Ratnakara. He also brought Buddhism to Tibet. In both India and Tibet, he is still much revered and studied. Hippocrates (460-379 BCE); Greek; the 'Father of Medicine'; he wrote 60 Treaties including works on anatomy, surgery, gynaecology, ophtalmology, pediatrics, embriology, psychiatry; he treated the body holistically, viewing the body in relation to its environment. He also removed medicine from the realms of myth, religion and superstition into the broad realm of science. He recognized diet, exercise, cleanliness and life-style as paramount in treatment, as was bloodletting, enemas, sweating, vomiting and purging; he also used over 300 medicines. He believed the 4 Elements of Empedocles manifested in the body as the 4 Humours: Bile, Phlegm, Blood and Black Bile. His most famous Aphorisms: ‘The Body Heals Itself’; ‘Let your Medicine be your Food and your Food, Medicine’; ‘Above all Else, Do No Harm’. The Hippocratic treatise On Breath is in many ways similar to earlier Vedic texts speaking of Wind and Prana. Interestingly, an old Hindu proverb is also ‘Your food is your Medicine’. Plato (427?-347 BCE); Greek Philosopher. 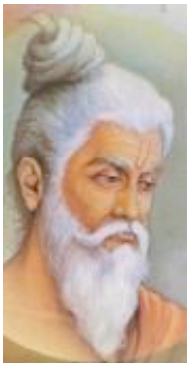 Wrote various works; in his Timaeos, pathology is very similar to the Vedic Tridosha theory. This and some other of Platos works were far more similar to Vedic texts than contemporary Greek texts. Theophrastus (371-286 BCE); Greek Philosopher; student of Aristotle; wrote Inquiry into Plants (reprinted as De Historia Plantarum in 1664) which had a marked influence for many centuries. Described extraction of Mercury from Cinnabar. Herophilios (335 BCE) made contributions to Anatomy. Empirical School of medicine was developed under Herophilios and Erasistratos (280 BCE) where Pharmacology and therapeutics were studied closely and greatly advanced. Serapion (280 BCE), a famous physician who wrote a formulary of drugs. Around 187 BCE after an Epidemic, a temple to Aesculapius was erected in Rome, introducing Pharmacy to Rome. Theriac being made in public in Venice. liked as it was made in view of physicians, apothecaries, nobility, and the public. Theriac (Theriac was derived from the Greek word Theriakon, being a medicine for venomous bites); this was a medicine combining many ingredients, primarily detoxicants, antispasmodics, stimulants and opium, and Viper flesh. There were many types and many formulas; Mithridate was a form of Theriac, the Theriac of Andromachus was one of the most famous Theriacs, while that prepared in Venice, known as Venetian Theriac, was most prized due to the public display of its making (above). Mithridate Eupator, King of Pontos (died 63 BCE). So paranoid was this King that he took small doses of Poison in order to become immune to them; even today, the method of becoming immune by gradual exposure is called Mithridatism. His paranoia was not unjustified, as Mithridate was said to have been responsible for killing many friends and relatives, including members of his immediate family. Named after this King was a medicine of the same name, compounded of many medicines used against poisons; it was said to be a universal antidote against poison, and was used for that purpose for well over 1500 years. Cornelius Celsus (25-30 BCE to 45-50 CE); the only notable Roman to write in the medical field, it is uncertain if he was a physician, or purely a scholar. His writings were based on 72 writings which no longer exist, gave a detailed survey of medicine from Hippocrates to his time. He was all but forgotten until Pope Nicholas V (1447-55) discovered his manuscripts. Roman conquest of Egypt (30 BCE) greatly increased the trade of medicines. Menecrates (1 CE) was a physician with an extensive knowledge of Materia Medica. He invented Diachylon Plaster which remained in use into the 19th century. Pliny; Gaius Plinius Secundus (23-79 CE); Roman Naturalist, Physician and Writer. Most famous for writing the 37 Volume Natural History, which is said to have been primarily based on the writings of a lost work by Quintus Sextius Niger, but was also said to have been compiled from over 100 previous writers. His writings are mixtures of Myth, Legend, Superstition, as well as facts from Pliny's own observation, and his predecessors. Pliny studied all aspects of nature; he died observing the volcano Vesuvius which erupted and killed him. During the time of Pliny, chief imports from India were sesame, sugar, spices, rice, spikenard, costus, pepper, lacca, indigo, frankincense and storax. Certain gems and minerals also. Dioscorides of Anazarba; Pedanios Dioscorides (1st Century); Roman; wrote 'De Materia Medica' (approx 77 CE, reprinted 1557) which was a cornerstone of European and Middle Eastern Pharmacy for over 1500 years. It contained over 579 plants, 90 minerals and 35 animals. Scribonius Largus; Roman physician of the 1st century. In 43 AD he accompanied Emperor Claudius when he attempted to conquer Britain. Author of the important work Compositiones Medicamentorum. Theriacum of Andromachus; this was an expanded form of Mithridate, made by Andromachus, physician to Nero. It contained 70 ingredients. Ruffus of Ephesos (98-117? ); Surgeon, Herbalist; wrote several important medical works; First to accurately describe Plague, Epithelioma and Erysipelas. During the Later Han period of China (25-220 CE) the Sheng Nong Ben Cao Jing (Divine Husbandman's Classic of the Materia Medica) was written and is the earliest TCM classic of Materia Medica. containing 365 herbs including Rhubarb, Aconite, Ephedra and Opium. Also listed was the use of Chaulmoogra Oil (Hydnocarpus sp.) for Leprosy. It is one of 10 Classic texts still routinely studied in China today. Wei Po Yang (about 120 AD) wrote a book called The Book of the Three Similars in which he spoke of making the Golden Elixir. According to legend, he went to the mountains with 3 disciples to make the Elixir. After making it, he said to his disciples that it should be tried on an old dog, in case it was poison. They fed it to the dog, the dog died, and Wei Po Yang then took the same medicine. One disciples believed his master would do nothing without good reason, and so followed suite. The other 2 left. Po Yang later revived (as the poison only mimicked death for a short time) gave an antidote to the Dog and his faithful disciple, and they continued to search for the Elixir. He is said to have discovered the Elixir. Chang Chung Ching, Chinese Physician, 142–220 CE (left); wrote one of the most famous TCM classics, Shang Han Lun (The Treatment of Disorders caused by Cold); he also wrote Chin Kuei Yao Lueh (Prescriptions from the Golden Chamber), both still viewed as important TCM texts. Zosimos lived in the Egyptian city of Panopolis around 300 CE. He is famous among the early Alchemists for his many works which included much writing on Alchemcial apparatus and procedures; one such work is On Instruments and Furnaces. He translated and decoded many earlier works by Democritus, Ostanes and Maria the Jewess. Vindicianus; was physician to Emperor Valentinianus I around 364-375 CE. From the 4th and 5th centuries CE, Chinese, Tibetan, Nepalese and Mongolian Monks were studying Buddhism in India. During this time, medical books from India began to be translated into Tibetan. From around 400–1500 CE, the Church controlled nearly all medical knowledge in Europe. The Church saw disease as being related to Sins and responsible for human suffering, and therefore, medical treatment was seen as the duty of the Church. During this time, it was the Monks and Monasteries who had major impact on herbal medicine, including the naming, growing and use of various medicines; they also translated many Greek and Latin texts, as well as some Persian and Arab texts. Monks often devoted their whole life to this work, and many also dabbled in Alchemy. In later medieval times, the Church was also responsible for establishing Hospitals and Medical Schools. Medical school in Djondisabour, in Arabistan, founded at the end of the fifth century by the Nestorian Christians. Around 500 CE begins the Middle Ages with the fall of the Roman Empire, and from the time pharmacy was largely controlled by Arabs. Monks in Europe (Benedictine in particular) devoted time to study and translation based on pharmacy, pharmacology and treatment. The Monks were forbidden to shed blood meaning they couldn't perform surgery. This led to the rise of barber-surgeons who performed bloodletting and minor surgery. Aetius of Amida (Aetius Amidenus); first Great Christian Physician; born in Mesopotamia, studied in Alexandria and was Physician to a Byzantine Emperor. Wrote his Sixteen Books on Medicine (around 550) and paid special attention to Pathology. He is said to be the first (western) physician to use magnets in treatment. Alexander of Tralles; Physician, possible teacher of Medicine at Rome; one of the great Independent thinkers of his time. Academy of Gondishapur was a center of medical, scientific and philosophical learning. Here, Greek, Zoroastrian and Persian traditions were studied and taught. During the reign of the Sassanid emperor Khosrau I (C.E. 531-579), Medical teaching thrived. He commissioned Syrian and Greek refugees fleeing the Byzantine empire to translate various texts. He also invited Indian and Chinese Physicians and Scholars to come and share their knowledge. This center revolutionised Medicine and Medical teaching, and helped give birth to the modern Hospital. All medical students were required to work in the hospital under supervision. The majority of the Physicians were Persian, but Christian physicians are known to have studied and learned with them. It is regarded as one of the most important medical centers of the ancient world. Chinese Tang Dynasty (618–907 CE); Tang Materia Medica (659) was written, this being China's first official illustrated herbal, containing 844 medicines. Also written during this period were works such as Hai Yao Ben Cao (Materia Medica from Across the Seas), showing the cross-exchange of Materia Medica. Paul of Aegina (‘Aeginetus’); another important early Christian physician; wrote several books on medicine, his Treatise on Surgery being especially significant; it describes surgery for Hernias, and opening the Trachea; he was also noted for his treatment of Women’s disorders. Persian and Arab Physicians were common in most large Chinese cities by this time and became well known for curing ailments where Chinese physicians had failed. During this period, Tibetan scholars traveled to India to learn the Doctrine of Buddhism first hand from the saints, and to bring it back to Tibet; simultaneously they were introduced to various Vedic texts which were translated into Tibetan. Also during this time, the first ‘International’ medical conference was held in Tibet in 685 CE. The King of the time invited Physicians from India, China, Persia, Nepal and Kashmir to share their knowledge in an open format. They all translated some important medical texts from their respective countries. During this period in Tibet, the court Physicians of the Tibetan Emperors were said to be Roman or Persian in origin. One Emperor appointed three Tibetan students to learn from this ‘Greek’ school of medicine. Jabir ('Gerber') born in the 8th Century; Arab/Islamic Alchemist. He wrote much on the Theory and Practice of Alchemy, his works having much influence on European Alchemy. He wrote of the 2 natures of the Alchemists (Mercury and Sulphur), Salt being added later. He also was the first to prepare Nitric acid. Yuhanna ibn Masawaih ('Mesue') (777-857), and Assyrian Physician who became director at Baghdad hospital. He wrote medical books on a number of subjects, and his writings and formulas were highly admired. He dissected Apes to learn Anatomy. Buddhism becomes firmly implanted in the Tibetan culture and psyche, bringing with it the fundamentals of Ayurveda. According to some sources, Galenic medicine was adopted in Tibet during the 7th and 8th centuries. During this period, several Sanskrit works were translated into Arabic for the Saracens (on the Syrian border of the Roman empire) by a Hindu Physician named Mankh. This happened after the cure of a famous Saracenian by the same. This shows the possible path of Indian knowledge through Arabia into Europe. This introduced important texts such as Caraka and Susruta to the Arabs, and gave them knowledge of the Indian use of Iron, Arsenic, Mercury and other Metals. Two centuries later, some of this knowledge filtered through to the Europeans via the Arab writers. gYu-thog Yon-tan mGon-po (Tibetan, 708-833); from a family of court physicians; in his teens, he was exposed to Buddhism and learned Buddhist medicine and treatment. He studied Buddhist Medicine in India and learned from other systems of medicine (Chinese, Indian, Greco-Arabic). He synthesized them and wrote the Four (Medical) Tantras; recognized as the “Father of Tibetan Medicine”. Appointed to court physician to King Khri-srong IDe'u-btsan (755-797) and founded the first medical school in Tibet at Cong-po Men-lung. Hunayn ibn Ishaq translated (c.830-870) 129 of Galen's works into Arabic. 'Rhazes'; Al-Razi (born 826?-923); possibly the greatest Islamic Alchemist/Physician. Didn’t study medicine until his later life, being a singer until 30; Closely studied Aristotle. He wrote 'The Book of the Secrets of Secrets' where he added the Nature of Salt to the first 2 natures of Gerber. These 3 principles formed a foundation for western Alchemy for the next millennium. He wrote much on Alchemical procedures. He also described Small Pox and Measles for the first time, and ran the Bhagdad Hospital under the Sultans request. His medical compendium Continens was to be superseded by the Canon of Avicenna. Govinda Bhagavatpada (Indian) composes the Rasa Hrdaya Tantra describing elaborate details for the processing of Mercury both for the preparation of Gold from base metals, as well as the internal use for health and longevity. Alkindi (Abu Jusuf Jakub ben Ishak ben Alsabah Alkindi) (800-873); wrote about 813-841 AD. at Basra and Bagdad on philosophy, mathematics and medicine. Arab translations of Charaka (seminal Indian medical text) exist by this time. 'Avicenna'; Abu Ali Alhossain ibn Sina (980-1037); Islamic Physician; and Alchemist; wrote the vast medical work, his 'Cannon of Medicine' which took off where Galen left, adding much knowledge derived from Persian, and possibly Indian sources. It had much influence over European medicine for almost 1000 years, being a standard text in European Universities up into the 17th Century, and is still studied in the East today. He described Meningitis, Tetanus and numerous other diseases in detail. He was already a great healer while still in his teens, having cured a ruler of a serious illness. However, Leonardo da Vinci rejected his views on Anatomy, and Paracelsus burned a copy of the Canon while teaching medicine. In the 8th century, the first encounters between Islam and Tibet took place due to the expansion of the Abbasid Empire. This was largely due to the trade in Musk. Leech Book of Bald (around 950; Leech being derived from the old English word for Physician); the First West European Herbal, being a book of Saxon herbalism which included herbal prescriptions from the East which had been sent by the Patriarch of Jerusalem to Alfred the Great, King of the Saxons in the 9th Century. Over 500 herbs were known to the Saxons, and their use was closely associated with Magic, Myth and Superstition. Alhervi (Abu Mansur Movasik ben Ali Alhervi); Persian physician who compiled a medicine work based on the writings of Greek, Arabic, Indian and Latin sources around the middle of the 10th century. Abulcasis; most important of the Arab Surgeons; born in Spain. Wrote the first illustrated book on medicine, three volumes on Surgery; it was still used as a reference until the 16th century. Lived to 101. During the 10th century, the Medical School of Salerno in Italy (above), was established. Its origins are believed to have been based on the dispensatory of a monastery. It is said to have been founded by 4 men: Adale the Arab, Salernus the Latin, Elinus the Jew and Pontus the Greek. It was well known for accepting any student regardless of race, creed or religion. The school was very active in experimentation, and students learned the use of such things as potent Anesthetics which were used during surgery and amputations (one example containing Mandrake, Opium and Henbane in equal parts, and was used externally under the nose to bring a deep sleep). A Department of Women’s diseases was created and this was given to Women professors. This school was responsible for many early translations of older Latin and Arabic texts. By the 12th century, its influence was seen throughout Europe, and both the sick and medical students came from far away to be treated or to study medicine. During the 13th century, it began to be overtaken by the School at Montpellier as the prominent medicine University. Constantine Africanus (c. 1020-1087, born in Carthage, Africa). He began work as a physician in Tunisia, and later traveled to Italy. He arrived at the School of Salerno in 1077 where he became one of the most renowned teachers there, partly because of his wide knowledge and translation of Arab medicine. He introduced the best of Arab medicine to the School, which influenced medicine throughout Europe. He translated many Arab works. Mesue (Jahja ben Masaweih ben Ahmed; ?-1015); ‘Mesue the Younger’; born in Kurdistan, physician to the Khalif Alhakem at Cairo. Avenzoar (1070-1162); Arab Physician, born in Spain. One of the great Spanish Arab Physicians. Averroes (Ibn Rushd) (1128-1198); Arab Physician, Philosopher, Astronomer and Theologian. 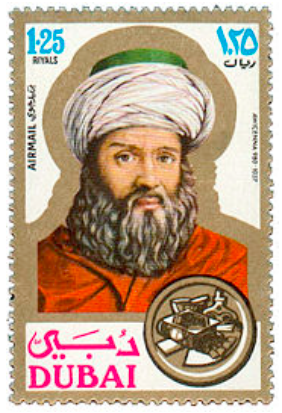 Maimonides (Moss Ben Maimum; Ramban) (1138–1204); Jewish Physician. He wrote the Regimen of Health for King al-Afdal, son of Saladin. Macer Floridus; wrote De Viribus Herbarum in 1140; first published in 1487; the best edition was printed in Leipzig 1832. Nicolaus Praepositus (1st half of the 12th century); one of the most famous physicians of the School of Salerno. His Antidotarium (first edition, Venice, 1471) gives about 150 formulas which were some of the most commonly used compound medicines for centuries to come. Antidotary of Nicholas of Salerno, written in the second half of the 12th century, was aimed directly at those wishing to study medicine. It is thought to be an abbreviated form of what was called the Great Antidotary, written around 1100. Matthaeus Platerius (mid 12th century); one of the most highly respected writers from the School of Salerno. He compiled Liber de Simplici Medicina, an impressive dictionary of 273 medicines which was studied and taught for centuries to come, and was still reprinted into the 17th century. Artephius (12th Century); one of the first European Alchemists; wrote ‘The Art of Prolonging Human Life’. Alchemy was well established in Europe by this time. Unani medicine arrives in India during this period. Alauddin Khilji (1296–1316) had several Unani Hakims (physicians) of note in his court. It was the donors such as this that supported the growth of Unani in India where it is still treasured as a minority medicine today. Tibetan Medicine came to Mongolia in 1235 when the King was healed of Paralysis by Sakaja, a Tibetan Physician. Around this time, there was an attempt to make Buddhism the official religion in Mongolia. Indian and Tibetan Medical books were translated and and Tibetan formulas became more popular. Medical schools were established at Montpellier, in Paris and in Bologna; medicine in Europe was slowly freeing itself of the Church. The University of Bologna was routinely carrying out human dissections by the end of the 13th Century. 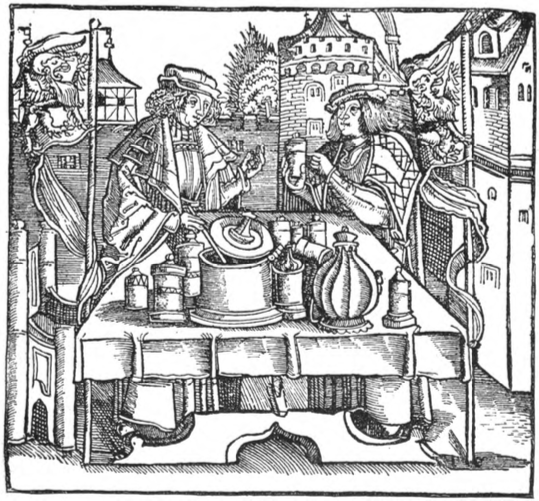 Pharmacy begins in Germany with an apothecary in Muenster (1285) and Augsburg (1318). Raymond Lully (born early 13th Century; stoned to death in 1315); early European Alchemist; over 480 texts have been attributed to him, although few have been verified. Legend says he was asked to transmute Gold for King Edward II of England; he agreed, only if the Gold went to the Holy War against the Muslims. Edward agreed, and Lully transmuted 50,000 pounds of Lead into Gold. 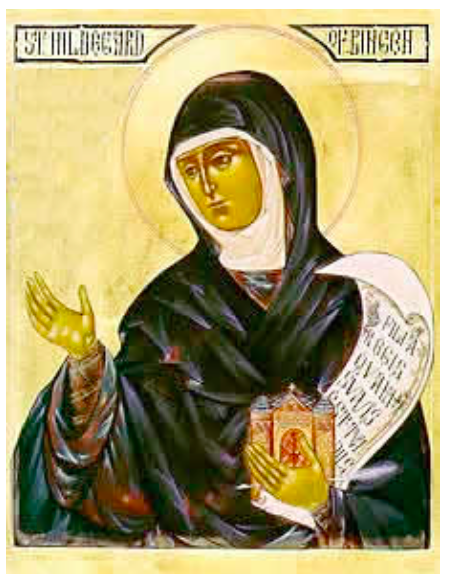 Hildegard von Bingen (left) German Saint, Nun (from the age of 15), Healer, Musician. She was a truly amazing women, who supposedly communicated directly with God, and was very intuitive. She wrote several medical works, including Physica, a large Materia Medica of Vegetable, Animal and Mineral medicines and the Book of Healing Herbs. Her remedies were simple, often incorporating Magic. She used the 4 element system of Galen, and promoted diet, fasting, bloodletting, cupping, prayer and affirmation in her healing. Albertus Magnus (c. 1193?-1280); German Philosopher, Astrologer, Alchemist, Magician and Theologian; Canonised by the Church in 1931. There are 2 books attributed to him: Mineralia, The Book of Minerals, and Liber Aggregationis, The Book of Secrets. Roger Bacon (1214-1292); English; Philosopher and Lecturer at the Universities of Paris, and Oxford, London. Arnold de Villa Nova (?-1313? ), a celebrated Physician who studied at Paris and Montpelier, and traveled through Italy and Spain. He was a Professor at Montpelier, and is said to have been the first to develop tinctures at the end of the 13th century. He was appointed Physician to Pope Clement V in Rome. He was ahead of his time and studied and practiced Alchemy, which, according to some, made him a target for the Inquisitors. The clergy of the time claimed his knowledge came from pacts with the Devil but due to a papal favor, he was untouched. However, a year after his death (approx 1313) the Inquisition decided that he had been dealt with far too lightly, and proceeded to publicly burn his writings. Some important works of his include Thesaurus Thesaurorum, Rosarium Philosophorum, Speculam Alchemiae and Perfectum Magisterum. Dynameron is written by Nicholas Myrepsus, a physician from the Court of Nicaea during the reign of Emperor John Doukas Vatatzes at the end of the 13th century. It is a collection of over 2600 recipes, inspired or based on the Antidotary of Nicholas of Salerno, it was translated into Latin in the 14th century, and became very popular. Baitar (Abu Mohammad Abdallah Ben Ahmad Almaliqi; ?-1248); often referred to as Ibn Baitar; born in Spain, traveled east; was a court Physician in Egypt; wrote a great work on Materia Medica. During the 13th century, the spread of the Mongol empire facilitated more exchange from east to west. Nicholas Flamel (approx. 1330-1415); Medieval French Alchemist; said to have transmuted Mercury into Silver, then into Gold in 1382. Basil Valentine (born around 1394); Monk, Physician, Monastic Alchemist of the Benedictine order. He wrote 'The Triumphant Chariot of Antimony', 'Of things Natural and Supernatural', and 'The 12 Keys', amongst others. He claimed the Physicians of his time were ignorant, arrogant and complacent of the true nature of Healing. Batutah; Ibn Batuta, of Tangier in Morocco (1303-1377); ‘The greatest Arabic traveler’; traveled to Caspian regions, Delhi, Java, Peking, and North Africa. Sir George Ripley (15th Century Alchemist); wrote 'The 12 Gates', almost entirely derived from Al-Razi (Rhazes). He claimed to have discovered the Philosopher's Stone, and also made a version of Aurum Potable. Leonardo da Vinci (1452-1519); Artist, Architect, Inventor, Engineer, Scientist, Mathematician; medically, he was most noted for his detailed studies of Anatomy which were derived from his work dissecting cadavers. Cornelius Agrippa von Nettesheim (1486-1535); Philosopher, Theologian, Magician and one time Royal Physician. Wrote ‘De Occulta Philosophia’. Alphita; a list of drugs and remedies, said to be compiled in the 13th century. Contained in Salvatore de Renzi’s ‘Collectio Salernitana’. Compendium Aromatariorum; written between 1442 and 1458 by Saladinus, physician to a Prince of Tarentum. Written for Apothecaries, it contained numerous compounds. Niccolo Conti; Venetian merchant who spent 25 years in India (approx 1419-1444); He relayed many interesting accounts, including medical knowledge, during that time. Paracelsus (right); Theophrastus Bombastus von Hohenheim (1493-1541); Swiss Alchemist/Physician; changed his name to mean ‘beyond Celsus’ (a famous old physician). He was a lecturer of Medicine, but was dismissed due to his radical, unorthodox views. He cured diseases other Physicians couldn't treat, and is known for demystifying Alchemy. He has 365 writings attributed to him. Paracelsus said ‘It depends only upon the dose whether a poison is poison or not’; his medicines worked on the principle that ‘a lot kills, a little cures’. Among the more bizarre legends of Paracelsus was his claim at having made a Homunculus; a small person, made from Sperm and Wheat, and nourished by the essence of blood. Johannes Actuarius; court physician in Constantinople towards the end of the 13th century; author of ‘Methodus Medendi’ and ‘De medicamentorum compositione’, both of which were frequently printed during the 16th and 17th centuries. Nicolas Monardes (1493-1588); physician at Seville; wrote several important works including De simplicibus medicamentis (Latin edition by Clusius) which detailed the use of Indian medicines. Florentine Pharmacopoeia, 1498 (Ricettario Fiorentino); one of the earliest, if not the first Pharmacopoeia published by authority. Editions of the Florentine Pharmacopoeia were printed until 1696. Pen Tsao Kang Mu (1578); written by Li Shi Zhen, taking 27 years to complete. It contained 1892 medicines. The Four Tantras (Tibetan medical text) comes to Mongolia where it becomes the primary medical text. Ambroise Pare (1510–1590); French Army Surgeon, considered to be the father of modern surgery. Valerius Cordus (1515-1544); Professor of Materia Medica at the University of Wittenberg; after his premature death, Conrad Gesner printed his works in a large volume in 1561. His work became very influential and highly respected. Conrad Gesner (1516-1565); born in Zurich, was one of the most learned naturalists of his time. Andreas Versalius; Physician, Professor of Medicine at the University of Padua; took off where Leonardo left, dissecting bodies, and publishing the first text of Anatomy On the Fabric of the Human Body (1543) which became the standard textbook of Anatomy. Tome Pires (also Pyres or Pirez); Portuguese Apothecary. Said to be the first ambassador from Europe to China (probably in 1511). Some of his letters, including to the King of Portugal, talked of the medicines used by the Chinese. Prosper Alpinus (1553-1617); Professor of Botany and Pharmacy at the University of Padua. Visited Egypt around 1580. Pietro Mattioli (1501–1577); published commentaries on the herbal of Dioscorides 1544 and 1554, selling 32,000 copies before 1561. William Turner (1510–1568); English Botanist/Herbalist (‘The Father of English Botany’); wrote Turner’s Herbal in 1550. Giovanni Battista Porta (1539?-1615); a nobleman who penned various works including De distillatione (Rome, 1608), Magia Naturalis (1589), and Phytognomica (Naples, 1583) which is chiefly a work on the Doctrine of Signatures. John Gerard (1545–1612); English Surgeon, Apothecary and Herbalist; wrote Gerard's Herbal, first published in 1597, which was enlarged, corrected, and re-released in 1633. This was largely based on a translation of a Herbal by Rembert Dodoens from (what is now) Belgium; Gerard added his own observations, as well as over 1800 woodcut illustrations. John Parkinson (1567-1650); ‘last of the great English Herbalists’; wrote several books including Theatrum Botanicum (1640) which describes over 3800 plants, and ‘A Garden of Pleasant Flowers’. Jacob Theodor Tabernaemontanus (?-1590); pupil of Tragus, physician at Heidelberg; wrote Neuw Kreuterbuch (Frankfurt, 1588); was printed and translated a number of times, translated into Latin in 1590 which included 2225 engravings. Wirtzung, Christopher; Praxis Medicinae Universalis; or ‘A General Practice of Physic’; first written in German, this was translated into English for the first time in 1598 by Jacob Mosan, and then reprinted several times throughout the 1600’s. This outstanding work systematically covers all parts of the body, giving medical treatment, both internal and external, as well as the application of natural medicines, both simple and compound; he also uses fasting, enemas, cupping, bloodletting, as well as some Chymical Medicines. This is a very good synthesis of the medicine practiced up until that time, and is most obviously written by someone with great experience. Nicolas Culpeper (1616–1654) (left); most noted for translating the London Pharmacopeia of the College of Physicians from Latin into English in 1649 which was unauthorised, for which he suffered much wrath. In fact, it has been claimed that this act by Culpeper was responsible for splitting mainstream Medicine from Herbalism. He also wrote Culpeper’s Complete Herbal, and The English Physician (1653). Culpeper was largely responsible for bringing Herbalism to the masses. He translated various works, wrote many others, and co-wrote/translated several important works with some of his contemporaries. Some of the more important works include: A Physical Directory (1649), Galen’s Art of Physic (1652), A New Method of Physic (1654), The English Physician Enlarged (1656), and A Treatise on Aurum Potabile (1657). Cole, William (1626-1662); authored 2 books, the most important being ‘The Art of Simpling’ (1656); he strongly advocated the Doctrine of Signatures. Schroder, Dr. John (? ); German; The Compleat Chymical Dispensatory in Five Books; this was written in Latin (first printing unknown) and translated into English in 1669. This work was commended by many authors, and is often quoted in various works of the time. It is very clear and methodical, giving various (Al-)Chemical preparations of Plants, Animals, and Minerals, along with their uses and doses. Schroder also gave clear references of his sources, and gave clear instructions based on his own vast experience. Nicolas Le Febre (?-1674); A Parisian Physician who also worked in London; wrote several important works, some of which were translated into English. Angelus a Sancto Josepho (originally Joseph Labrousse; 1636-1697); Carmelite Monk; in 1681 published in Paris a Latin translation of Pharmacopoea Persica, being a Latin translation of Persian (Unani) formulas. Jean-Claude-Adrien Helvetius (1661-1727); physician at Paris. The Royal Pharmacopeia, Galenical and Chymical according to the Practice of the Most Eminent and Learned Physitians of France (1678), Moses Charras; this is typical of the lust for knowledge once printing was freely available; various texts from other languages were being readily translated and printed in English for the first time; in this case, the official French Pharmacopeia. This gave very clear details on the preparation of all formulas, including the different times various substances were added to compound decoctions etc. In this respect, this is probably the most detailed, as the London Pharmacopeia was notorious for being unclear on various matters, and not stipulating correct order of processing etc. Dutchman Anton van Leeuwenhoek develops the Microscope. Dr. Anthony Storck (Baron Storck) (1731–1803); established the use of several important herbal medicines into European practice including Pulsatilla, Hemlock, Datura, Henbane and Aconite. Read his Experiments on Aconite. Hipolito Ruiz (1754-1816); Spanish botanist who led a celebrated exploration of Peru and Chile in 1777. Samuel Hahnemann (1755-1843); founder of Homeopathy; used the traditional Materia Medica in minute doses, being more acceptable to him and many of his time, who were no longer satisfied with the overuse of poison and metallic drugs. In 1796, English physician Edward Jenner used Cowpox to immunise a boy against Smallpox, this being the beginning of immunisation. From the late 18th to mid 19th century, there was a marked movement away from Traditional Medicine towards Modern Chemical Medicine. English and European Pharmacopeias and Materia Medica were inundated with new chemical medicines and individual components from herbs. Herbal formulas were greatly simplified and only active medicines such as purgatives were continued, many of the formulas in use for many centuries being expelled from the practice during this time. The discovery of bacteria as responsible for many acute infections meant chemical medicines proven to be effective against specific pathogens were widely used over traditional herbal preparations. During the 1800's in the U.K., Europe and U.S,, Herbal Medicine moved from being the main weapon in the fight against disease, to becoming Folk Medicine. In 1942, an Indian Saint by the name of Sri Krsna Lala Sarma performed in the incredible and seemingly impossible task of transmuting Mercury into Gold at a temple in Delhi, India. Several Government Officials were present (including a noted Indian Industrialist). In front of these officials, around 2.4kg of Mercury was mixed with 12 grams of an undisclosed powder, the whole mass being heated over a fire for a short while, when it was found the whole weight had been transformed into pure Gold. The process was repeated, with over 20kg being prepared in total. This astonishing event is commemorated by 2 plaques (above) which give the date and year, the name of the saint who performed the experiment, the names of all officials who were present, as well as a brief description of what they witnessed. They also commented that the practitioner was always no more than 10 or 15 feet away from them, and in clear sight. Similar accounts are officially recorded several times throughout India's history, the earliest being in the 4th Century BC. In 1950, Chairman Mao Zedong made a speech saying the Chinese Communist Government should promote Traditional Chinese Medicine as a national treasure. During a visit to China in 1971, James Reston, a US reporter developed an acute Appendicitis. He was in China to cover the trip to China of Dr. Henry Kissinger. Reston had surgery to remove his appendix, and during his recovery, developed severe acute abdominal pain. Rather than being treated with Western medicine, the Chinese doctors applied Acupuncture which was remarkably effective. Upon returning to the US, Reston wrote an article for the New York Times in which he described his Acupuncture treatment. He also told Kissinger, a close acquaintance of his, about his experience, and Kissinger reportedly passed this on to President Nixon. Nixon was evidently very impressed with the story and organised Chinese Doctors to visit the US and share their Acupuncture knowledge. This is directly responsible for the rapid rise of Chinese Medicine in the West, and paved the way for the rise of Traditional Medicine in modern society.